My husband loves fried chicken. No, I mean he’s really in love with fried chicken! I don’t think you understand how serious this is. If it were possible to marry fried chicken, I would be kicked to the curb. And I really can’t blame him. Fried chicken is one of those pleasures in life that the vegan, healthy eating, everything-that-you-put-in-your-mouth-that-even-remotely-tastes-good people have waged war against. I’m not talking about the fried chicken that comes from the Chinese carry-out with a bit of mambo sauce on the side (what is mambo sauce anyway?) or the faux home cooked, mechanically shaped stuff that you get from KFC. I mean the juicy, salty, sweet, crispy deep fried hugs that your Grandma would stand over the stove for hours cooking in that old black iron skillet. Chicken that’s so good you would seriously contemplate selling one of your kidneys for just one juicy leg. Because you always have another kidney, but fried chicken like Grandma made is hard to come by. I don’t remember my first experience with fried chicken because, like a loyal friend, it’s always been in my life. And it always makes me smile. 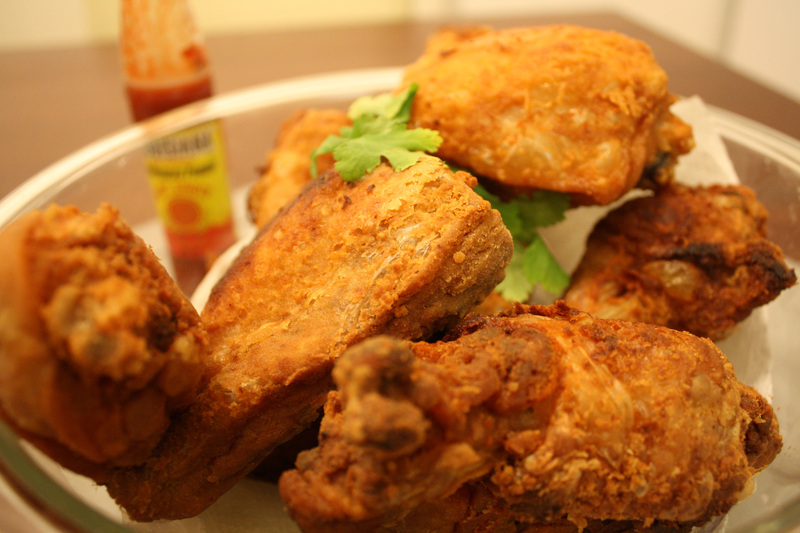 Most of my best memories revolve around food, and more specifically around fried chicken. I suspect, if you are Black and from America, yours do too. Remember your loyal friend lovingly nestled in the shoe box when you took those long car trips (or was that just my husband’s family)? Remember those family picnics where the fried chicken took center stage? Everyone’s Grandma had a Crisco can on the stove full of bacon grease. For many of us, our first experience with cooking was shaking the chicken and flour in the brown paper bag. And that first bite of chicken hot from the grease, the crunch giving way to the juicy molten goodness dripping between your fingers. Fried chicken has just always been part of the family. I don’t fry chicken often now. Even on the best of days, it’s not that great for you. This is really interesting since our grandparents ate it at least once every week and they lived well into their gray old chicken eatin’ days. Nonetheless, the health gods tell us that we shouldn’t eat it at all or “oven fry” it without the skin because it tastes just the same. Yeah right… who ever said this has never had a Grandma that fried chicken. So now, in my effort to keep my husband around for at least the next 80 years, I save it for special occasions – birthdays, family get-togethers, the first Eagles football game of the season, or when I just feel down. And of course, anytime a little extra happy won’t hurt. I will continue to fry chicken and making wonderful memories. One day, I’ll be the old grandma in the kitchen with the iron skillet frying up a batch with plenty of oil, plenty of seasoning and plenty of love. You’ll need several basic tools which you should have already. Tongs for turning the chicken (you don’t want to pierce the chicken with a fork as you’ll lose all the juicy goodness). Wash chicken and pluck any stray feathers (yes in the UK you must do this) and use clean paper towel or dishtowel to completely dry it. If you’ve chosen to make chicken breasts, cut the breasts in half to ensure the meat gets thoroughly cooked. Season chicken with your preferred seasoning and refrigerate for at least an hour. When ready to cook, remove chicken from fridge and set aside. Place the dry pan on the stove on medium heat (5 on electric stoves) for 2 to 3 minutes. NOTE: If you have a pan lined with Teflon or you are unsure whether the pan is lined with Teflon do not follow this step (Teflon can be toxic when burnt). While waiting for pan to heat, add about 1 cup of flour to a plastic bag and add two generous pinches of seasoning to the flour and shake. When done, fill the pan to a depth of about 1 inch and increase heat to medium high (7 on electric stove). 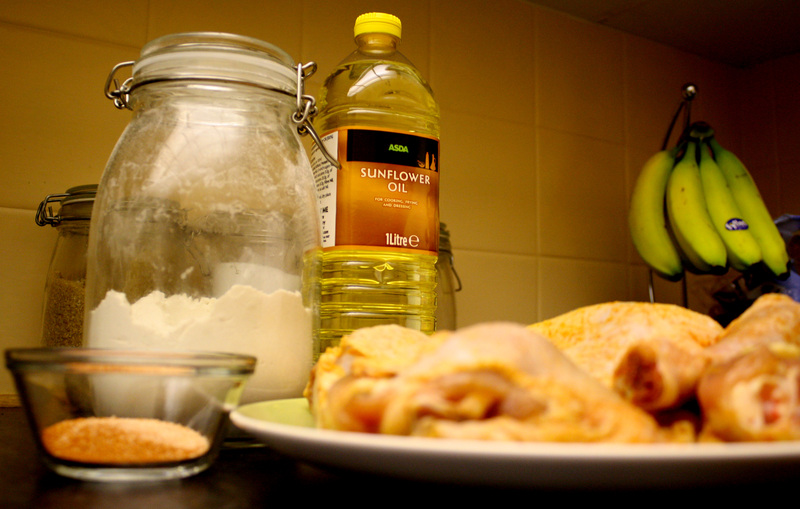 While the oil is heating, place chicken in flour a few pieces at a time and shake to coat. 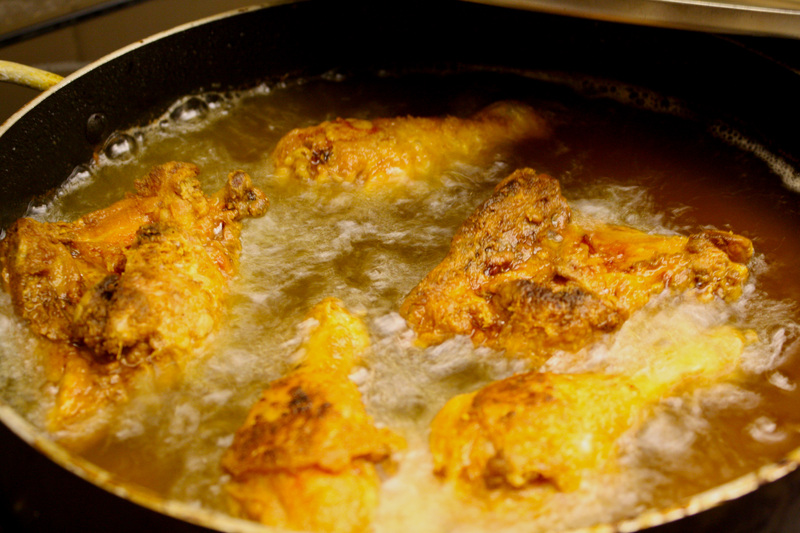 Once all the chicken is coated, check the heat of the oil by using the kitchen thermometer. The temperature should be between 350 and 375F. Another method is to add a piece of bread to the oil, if it turns golden brown within a minute the oil is hot enough. If the oil is too hot, move the pan away from heat for a minute or two and test the temperature again. Once the oil is hot, it’s time to cook! Carefully place the chicken in the pan one piece at a time. Make sure that the pieces are not touching. Once the pan is full, cover it tightly. The oil will be rapidly bubbling at this point. Remember this sound. When the bubbling slows down, it’s time to check the chicken. This should be about 15 minutes. If the chicken is the proper crispness, careful turn each piece, and continue to cook uncovered. Again, you should hear rapid bubbling. When it slows down (about 5 to 10 minutes), check again by removing the largest piece and piercing the meatiest part with a sharp knife. If the juice comes out tinged red or pink, put the piece back in and cook some more. Once done, remove the pieces and place them in paper towel lined bowl. Next Post Hooray for Pancake Day! We are looking forward to viewing this frequently. Love you and Mike…….Bruce & Sharon from Harrisburg, Pa. The same process will work for fish. Just omit using the lid while frying. Thin white fish fillets works best or a whole fish like seabass. Thanks so much. I’m glad you’re enjoying the recipes. More to come soon. Wow – Your blog is lovely, pictures are great… can’t wait to taste this cooked by your hands!